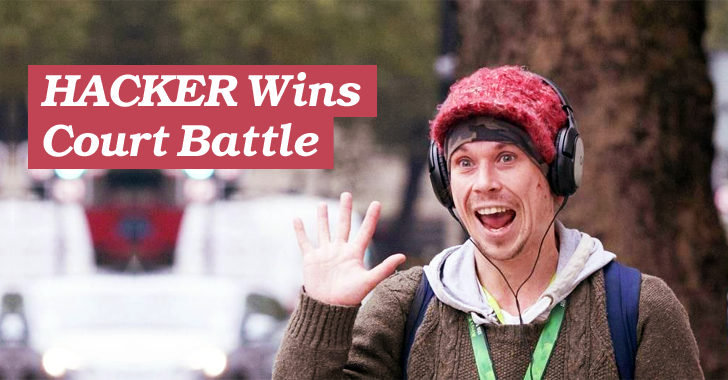 Britain's top crime fighting force has failed in a legal attempt to force alleged hacker Lauri Love to hand over his hard disk's encryption keys. In a landmark case, District Judge Nina Tempia said the investigative agency should have used the normal police powers rather than a civil action to obtain the evidence. Lauri Love, a 31-year-old hacker, has been accused of aiding cyber-attacks against U.S. targets, including NASA, FBI, US Army and US Federal Reserve networks. The National Crime Agency (NCA) has failed in a legal attempt to force the British citizen and political hacktivist Lauri Love to hand over the keys to encrypted data that has been seized from his home two years ago. At a Tuesday hearing in Court Seven at Westminster Magistrates' Court, the NCA's application to make Love disclose his encrypted computer passwords was refused by the judge. Hacker Fighting Extradition to U.S.
Love, 31, is currently fighting extradition to the United States where he faces up to 100 years in prison for allegedly hacking into the Federal Bureau Investigation (FBI), the National Aeronautics and Space Administration (NASA), the US Missile Defence Agency, and Federal Reserve Bank of New York during 2012 and 2013. United States Prosecutors claim that Love was allegedly involved in the online protest #OpLastResort linked with the Anonymous group, following the untimely death of online activist Aaron Swartz, who committed suicide in 2013 while under federal charges of data theft. Love was initially arrested from his home in Stradishall, England back in October 2013, when the British police seized his encrypted computers and hard drives. The NCA later asked the courts to force Love to turn over keys to decrypt his computer's hard drives. The files that authorities say could contain data from the US Senate and the Department of Energy on Love's computer has been encrypted with Truecrypt, a popular software for encrypting data. Initially, the British agency attempted to compel Love to hand over his encryption keys and passwords under Section 49 of the Regulation of Investigatory Powers Act (RIPA) 2000, but was failed after his refusal. Love, who is currently on bail, launched a legal action against the NCA to return his computer equipment. However, the agency refused, claiming the devices could contain data that he did not legally belongs to him – for example, hacked files. So, as part of those civil proceedings, the agency made an application to force Love to hand over his "encryption key or password" for the encrypted data found on his computer and hard drives. However, Judge Nina Tempia of Westminster Magistrates' Court in London ruled in favor of Love, saying the NCA can not force Love to disclose his passwords and encryption keys to prove his ownership of the data. Tempia also said the NCA has attempted to "circumvent" the RIPA act, which she described as the "specific legislation that has been passed to deal with the disclosure sought." "I am not granting the application because to obtain the information sought the correct procedure to be used, as the NCA did two-and-a-half years ago, is under section 49 RIPA, with the inherent HRA safeguards incorporated therein," Tempia wrote in her ruling on Tuesday. The NCA has yet to comment on the court proceedings. However, Love was "happy" with the result. Speaking outside court, he said: "It is a victory, although it is a more an avoidance of disaster." The court hearing revolving around the return of Love's computer equipment is scheduled for July 28.